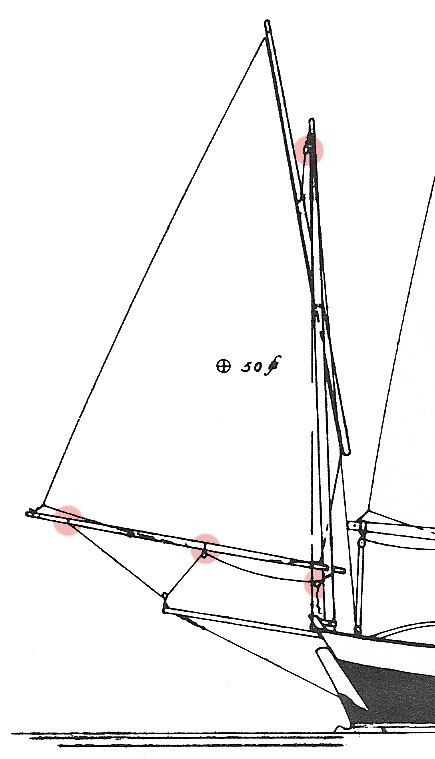 Last time, I complained about a mystery that has plagued me and at least one of the Blue Moon's former owners: how to hoist and control a sail when the mast, boom, and yard are essentially bare poles? As usual, there isn't any mystery for experienced builder/sailors -- i.e., for those few, those happy few, for whom the lost arts of the wooden boat sailors are not lost. But for the rest of us, this voyage into the past must be one of discovery. Oddly enough, the standard boat building texts aren't much help. They all explain how to make spars, but are strangely silent on the subject of attaching them together. Chapelle's "Boatbuilding " at least explains why: "The details of rigging have been covered in many books; it is too specialized a matter to be discussed here." The 'many books' that Chapelle assumed to be in every sailor's basic library are now forgotten and out of print, but the answers are preserved in some of the specialized books written by traditional boat lovers, riggers, and sailmakers. In particular, there is a drawing in Brian Toss's "Rigger's Apprentice" , that shows practically everything I was looking for. If you have this book, it's on page 208. Not to keep you in suspense, the solution I was looking for is the common rope grommet. At least they used to be common. A grommet is simply a piece of rope that has been spliced into a loop. An incredibly useful loop. For example, if you seize a thimble in one end of the grommet, as illustrated in the photo above, it's easy to hang one over the 'shoulders' of the mizzen mast (over the shroud eyes, so it can't slide down.) Shackle on a block, and the problem of how to hoist your sail without mast hardware is solved. Compare this stout and sturdy bit of rigging to the plastic cheekblock that tried to replace it. Which would you rather bet your life on? You can use the same sort of grommet to hang a sheet block off the boom. The easiest way to keep it from sliding around is to seize it tightly to the boom. You could also use thumb cleats or eye straps screwed into the top of the boom, but I don't want to make any more holes in my spars unless they are absolutely necessary. My first effort wasn't perfectly shaped, but it certainly was strong -- probably at least 98% as strong as the rope itself. Red dots show where I plan to use rope grommets. So, rope grommets -- with blocks shackled to their ends -- will allow me to both raise and control my mizzen. But there still remained the mystery of how to keep the whole kit-and-kaboodle from falling into Long Island Sound every time I slack off on the halyard. That, I think, is where those two missing eye straps come in. The upper part of the lazyjack is a line, fixed at it's middle to the top of the mast. At each end of the line, thimbles are spliced in to allow the lower parts, or legs, to run freely. The legs are just another line. It's tied to the boom at (1), led up the back side of the sail through the eye (2) and back down to the boom, where it passes through the aft eye strap (3). It then goes up the front side of the sail, through the eye (4), and back down to the boom (5). Instead of being tied off, the line is led along the boom through fairleads into the cockpit where it is tied off to a cleat (6). You can pull on this line to tighten up the system to make it work like a topping lift, or slack it off for sailing. Since the strap eyes are on the bottom of the boom, and just hold the leg line in place, the topping lift will be as strong as the line and spars. Pretty clever, these old timers, eh? Finally, how to keep the yard -- the 11' pole laced to the top of the sail -- under control while I raise and lower the sail. As I said, this baby swings around like a bucking battering ram in a breeze. The lazyjacks will help, but it needs something more. Again, the plans hint at the solution. Notice the line across the mast, where the mast and yard cross. I'm sure this line was all Tom Gilmer needed to draw to suggest a parrel line to his readers in the 1940s, when such things were common. What's a parrel line? According to Wikipedia, it's "A movable loop or collar, used to fasten a yard or gaff to its respective mast. Parrel still allows the spar to be raised or lowered and swivel around the mast. Can be made of wire or rope and fitted with beads to reduce friction." Loop? Rope? Sounds like the perfect job for yet another grommet! So, that's my solution to the Mystery of the Blue Moon. It's not the only one, of course. There are many correct solutions to this puzzle. But it's a satisfying one that fits all the clues left by the Blue Moon's original builder, whoever he was. More importantly, it should tame my mizzen and turn it into a useful sail that can be quickly raised and lowered without a fuss. Looks like you have worked a really good solution, I'm guessing there is no right and wrong - more than likely each boat would be slightly different according to their owner. You beat me to it! I had a very similar idea for the Mizzen. I was going to suggest a Bunt Line to gather up the mizzen as the legs of your arrangement do - I don't know if Bunt Line is a fore and after's term, but it is what it is called on a square sail, and is the basis of getting that sail in (Along with the Clew lines). The Stay sail is an interesting problem. The rig/sailplan drawing does not show where the clew comes with regard to the mast. If it is aft of the mast so you have an overlap. then making it self tack is a problem! If it is clear forward of the mast then life gets easier. A common Cornish solution to this one is a Sheet Horse across the ship just forward of the mast. The clew is sheeted to a traveler on the horse, and will self tack. The lead of the sheet, and the height of the Clew will affect the set of the sail, and may cause back winding of the main by the staysail. In looking at your explanation, I realized your mizzen is almost rigged like a lateen sail. There are differences of course, but your upper spar is what triggered the thought. 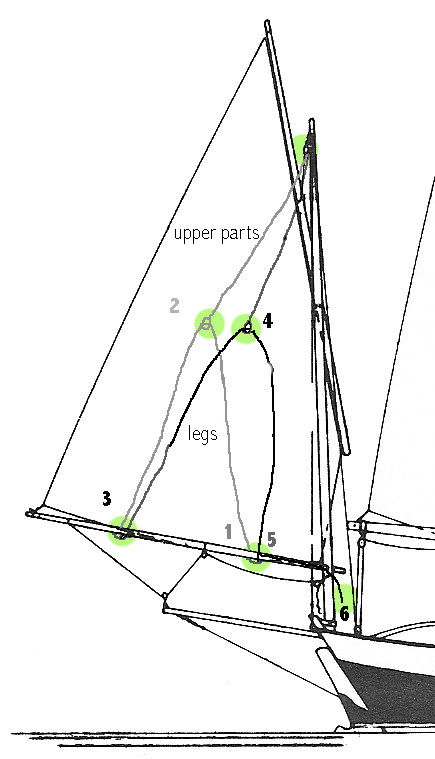 My sunfish has a lateen rig, but the boom and yard are joined at the forward end, making the the sail triangular in shape. Jim: the staysail is on a club boom and it should be self-tacking. It does in fact self-tack, but the way the sheet was lead forced me to adjust the sheet each time I tacked, because it was longer on one side than the other. Jeff: yes, the peak is pretty high, so it's sort of like a lateen, but the yard isn't attached, of course. Bursledon Blogger: There's definitely more than one way to skin this cat. I'm going to have to experiment with the placement of the grommets... another reason to hold off on the eye straps. I've got a bunch of parrel beads, so I'll give them a try. ditto on the parrel beads- less chafe on the parrel line, and easier spar raising and lowering.